As a writer, I never know when a story will present itself… Today the following story was literally sky high. I could not believe my eyes and snapped this quick picture with my iPhone. Well the rumor was that Reg was seeing a local celebrity young lady here in Indy (one that did tv commercials and was well known for selling tanning bed and hot tubs)…and Marita burn down the house because the young celeb was pregnant! Who knows what was the real story, but here’s another story about the house on Geist (which I was boating with my girlfriends the other day and we boated past Reggie’s house which is very fine I will say). I will testify that everyone loved Reggie here in Indiana though. He was the heart and soul of the Pacers!! Being the wife of an NBA superstar, legend, and future hall of famer should be a full enough life. Not so for Marita Miller, Reggie’s wife. Mrs. Miller fancied a Hollywood movie career and wanted Reggie to buy a house in California. Instead, Reggie began construction on a $3 million mansion outside of Indianapolis. When it was completed in July of 1997, Marita began dutifully moving the family in until one night the house burned to the ground. Personal items lost in the blaze (either stolen or destroyed) included a wedding ring, an expensive watch, and basketball memorabilia. Results of tests conducted on debris from the fire confirm that the fire was set intentionally. While Marita Miller was never charged with arson, locals point to her as the only person in Indiana who would have done such a thing to Reggie Miller. Three years after the blaze Reggie Miller filed for divorce from his wife of ten years. In accordance with a “pre-marriage agreement,” Marita Miller was to receive $3,000 per month. Marita Miller had a 2001 film credit in Dinner Rush, starring Danny Aiello. 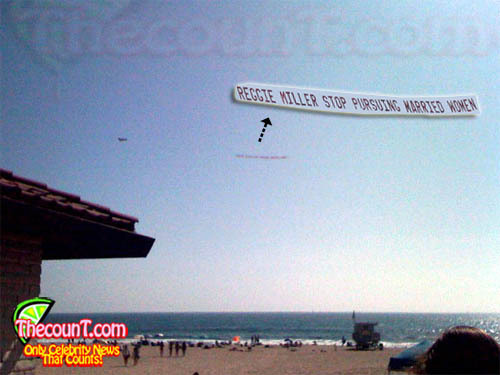 Reggie Miller now owns a home in Malibu in addition to his home in Indiana. Did you know Reggie’s X wife burnt down his mansion because he was ‘pursuing married women’ years ago too? This is a normal thing with NBA players. Not really surprised. reggie is in SERIOUS trouble!